This past week Joshua and I visited a home cell Bible study in a local community where there is a large concentration of non-Christians. A new church plant started in this community that is distantly connected with Francis Chan’s church. We met on the front landing of a lady’s home. She smiles often and shares her gift of hospitality. Our time of worship begins with a welcome from an older teen who lost both his parents in the last few weeks. Death is a harsh reality in Uganda. After the welcome, he asks one of the ladies to lead in singing. There are no instruments, so she sings and claps with joy and a smile. We all join in, a song in English and one in Luganda, while another one or two locals provide an offbeat clap to give some variety and rhythm. A few small children from the community who are passing by and watching with much interest, begin to dance. I love the ability of the Ugandan people to worship and sing joyfully without instruments. After singing, we prayed, and I led the Bible study. One of the leaders of the church translated for me. As we wrapped up and were leaving, the sun settled over the western Africa horizon. Joshua seemed to enjoy the time there, so as we traveled back home I asked him what he thought. I was expecting him to politely request to stay home next time, which would have been OK. But he said he really enjoyed it. The locals make you feel welcomed and appreciate that we are learning their language. A new home cell group starts this week in the same area! volunteer basis to almost twenty pastors. The opportunity presented itself and after speaking with my supervisor, it seemed clear that this opportunity matched the goals of our mission agency, Equip Uganda, in equipping locals. These pastors come from various east Africa countries. 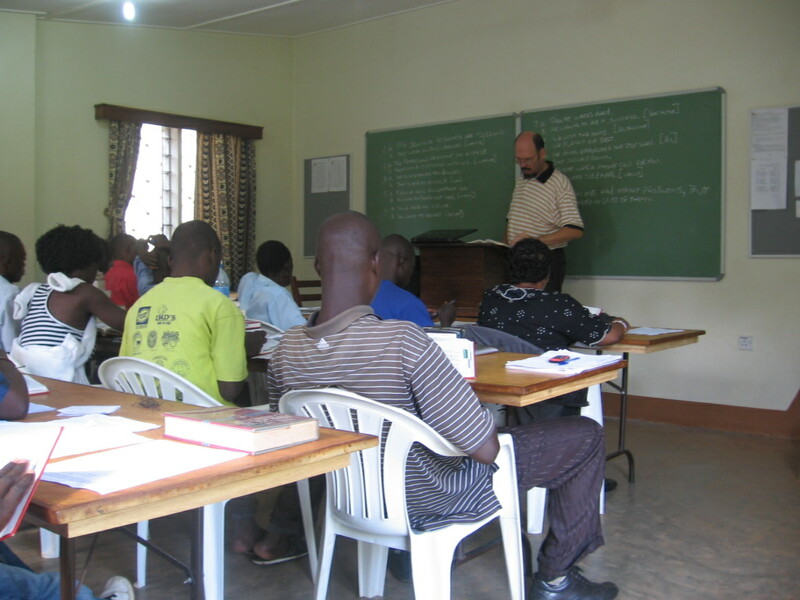 They take about twenty-three English sessions, while they work toward their theological degree. 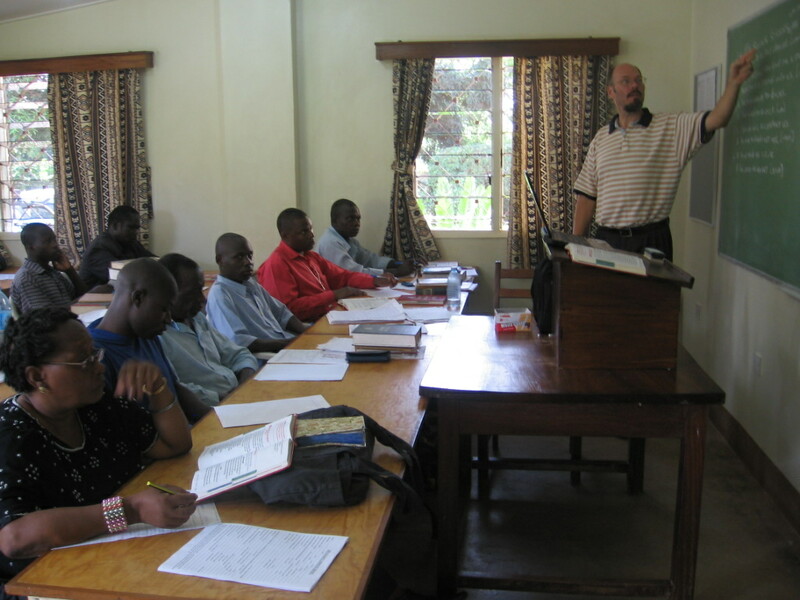 I taught one of the twenty-three English sessions for 1½ hours a day, six days a week, for three weeks. It was enjoyable. Alexis visited the class to snap a few photos. As this week begins and as the Spirit reminds you, would you be so kind as to pray for Alexis? She has had some pain with her teeth moving as two wisdom teeth have formed, but not yet erupted through the gum. So we had a dentist from the States, who is visiting Jinja, look at Alexis’s teeth. Because it would involve surgery, he recommended another dentist that he would personally use. This dentist has a great reputation with missionaries. So we plan to see that dentist this week about extracting her two wisdom teeth. Prayers going up for Alexis. I hope all goes well! Praying especially for Alexis. Love seeing the pictures and hearing how God is moving in your lives. I miss you!